This page shows the latest constipation news and features for those working in and with pharma, biotech and healthcare. HAE, prucalopride (SHP555) for chronic idiopathic constipation, and calaspargase pegol (SHP663) for the treatment of acute lymphoblastic leukaemia (ALL). 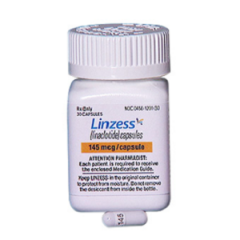 includes Linzess (linaclotide) for IBS with constipation. unpleasant side effects such as severe constipation. Approximately 8 fully matching, plus 64 partially matching documents found. Diarrhoea, constipation, flatulence, leaky bladder, vaginal dryness - it’s all fertile territory. His pioneering research culminated in the drug, Trulance, which has received FDA approval and is being used to treat irritable bowel syndrome and chronic constipation. $110. AstraZeneca/ Kyowa Hakko Kirin. Opioid-induced constipation – Moventig. Licence. $70. years. Among a newer generation of orally-delivered peptides is Ironwood Pharma's peptide drug Linzess/Constella (linaclotide) - which debuted in 2012 for constipation associated with irritable bowel syndrome. 941. AstraZeneca / Daiichi Sankyo. Co-commercialisation US . Marketed Movantik (naloxegol) for opioid induced constipation. irritable bowel syndrome and constipation. Appointment follows nearly two years as global brand manager for constipation treatment Movicol. ... Hockey's promotion comes after nearly two years as global brand manager for constipation treatment Movicol since joining Norgine in 2011.